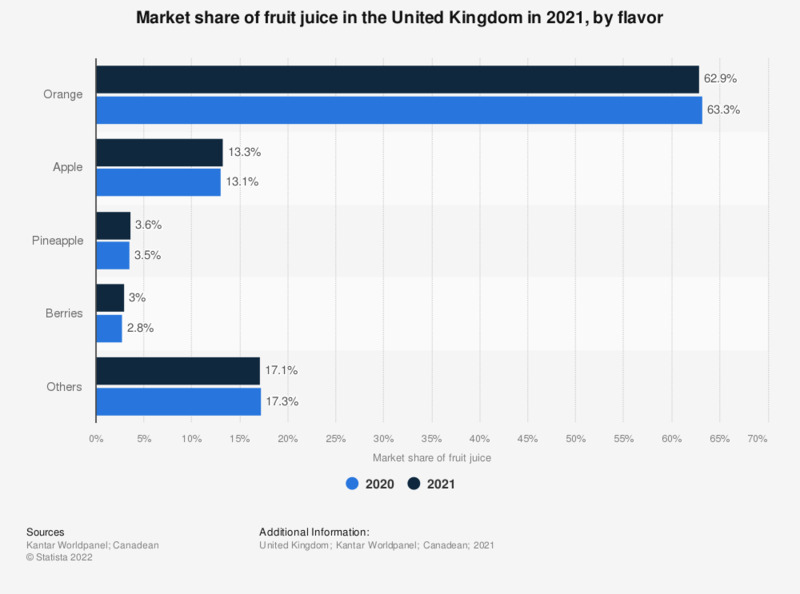 The statistic shows the market share of fruit juice in the United Kingdom in 2016, by flavour. Apple fruit juice drinks shared 14 percent of the UK market in 2016, while orange fruit juice drinks represented 64 percent. The report defines fruit juice as follows: "100% fruit content equivalent, sometimes referred to as pure juice or 100% juice. Chilled juice comprises four main types: freshly squeezed juice; not from concentrate juice; chilled from concentrate (may be from concentrate or part from concentrate); snmoothies. Ambient or long life juice is mainly from concentrate."